The Africa-based Footballer of the Year delivered a solid, stereotype-defying performance. Good handling and command of his area ensured the score remained a lot more respectable than it should have been, allowing Uganda to mount a charge in the latter part of the game. Gakpe is a forward/winger by trade but we saw him positioned at right back against the African champions. Although he was faced by an ineffective Salomon Kalou, who was stationed on the left wing, he did a good job even when the more orthodox winger Max Gradel came on. 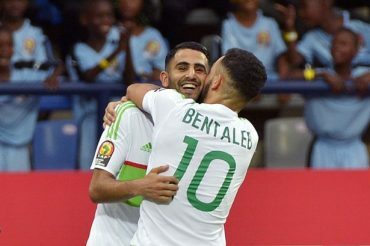 The Leicester defender’s composure at the last AFCON made him one of the players of the group stages before injury saw an early end to his tournament. He was typically composed against Uganda aerially and on the ground; Uganda’s forward line never really got the better of him. Usually a central midfielder but, like Gakpe, we saw him in an unfamiliar position at centre back. Claude Le Roy needed good performances from his experienced players, and he certainly got one from Romao as he nullified Jonathan Kodjia for much of the game. The shoes of Adama Tamboura are big ones to fill at left back but Hamari Traore did a sterling job on his first tournament outing. His endeavour, energy and neat footwork made him one of the best players of the pitch versus Egypt. As Algeria went for the winner, the rest of Katsande’s team may have been showing signs of tiredness creeping in but the captain led by example by standing form. Algeria didn’t have too much joy in central areas thanks to his tough tackling. Morocco’s first half against DR Congo was the best half of football by a team in the tournament so far. Boussoufa was key to their 5-2-3/5-4-1 system, his calmness in possession and range of passing ensuring dominance in midfield. The African Footballer of the Year lived up to the billing, scoring a brace to spare the blushes of his team against unfancied Zimbabwe. While the rest of the Algerian attack toiled, Mahrez was its most proactive member and his goals not only reinforced his status but, in case people have forgotten due to Leicester’s form this season, served as a reminder of what he can do. Captain for the opening match in place of the dropped Bocundji Ca, and he underlined his importance to Guinea-Bissau. A strong second half against hosts Gabon swung the momentum towards his team. It was his free-kick that found Juary in the box for the equaliser and, prior to that, Frederic Mendy had failed to get the right connection on another quality delivery. The 2015 Player of the Tournament carried on from where he left off, terrorising Uganda left back Joseph Ochaya to the point where everyone watching wondered whether the defender would be back for the second half. Speedy, direct and not shy at attempting an effort on goal, full-backs, like two years ago, won’t enjoy facing the 25-year-old when he’s in this kind of mood. Another player tipped for a big tournament, and he delivered on his tournament debut as Zimbabwe nearly shook the tournament. Were it not for the post and an inspired Rais M’Bolhi, Billiat could have walked away with at least a hat-trick.